Chef Myke “Tatung” Sarthou returns to his Quezon City roots and opens up a new restaurant called Alab. I’ve always liked how Chef Tatung focuses on Filipino dishes. And his current menu of Filipino food from different regions is obviously well researched. The gising gising they serve is made with seafood and vegetables in coconut milk; not the usual chopped kangkong in gata. 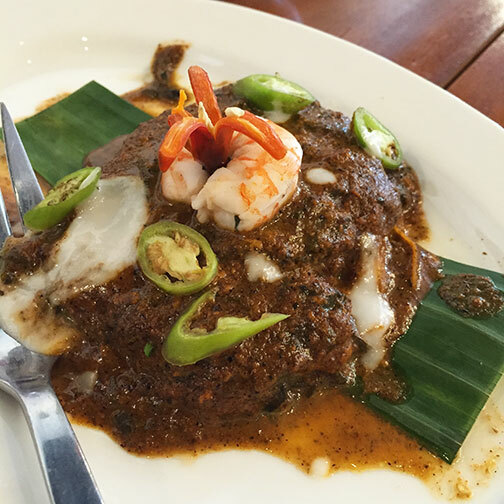 There are Pampangueno dishes like kalderetang kambing (topped with quezo de bola) and bringhe (served in slices). 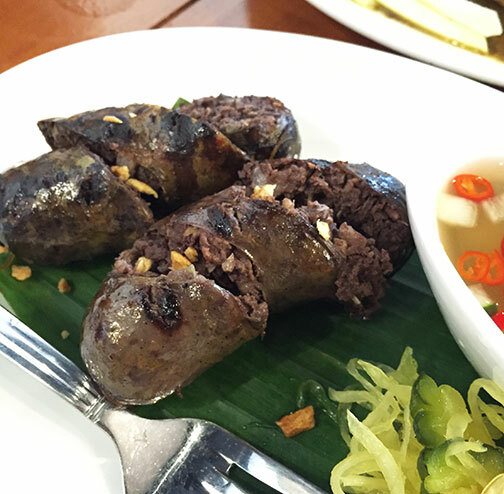 Wanting to sample items along these lines, we had ordered the penuneng: an Ilocano style blood sausage. Essentially dinuguan in sausage form; so nothing really mind blowing. Deep, mineral flavor and very porky. We had also sampled the tinumok: a Bicolano specialty made of coconut meat stewed in coconut milk and shrimp paste and wrapped in gabi leaves. I’m quite familiar with this dish as I love the ones a friend brings in from Bicol. Very similar to tinuktok/pinangat/laing save for the chopped coconut meat. I think maybe coconut producing areas would have this similar preparation but of course the Bicolano version I prefer more because of the use of chilies. I’m used to it being soft and cooked down. But this version in Alab keeps the freshness of the coconut meat in that there’s still that pleasant bite. A not bad interpretation. 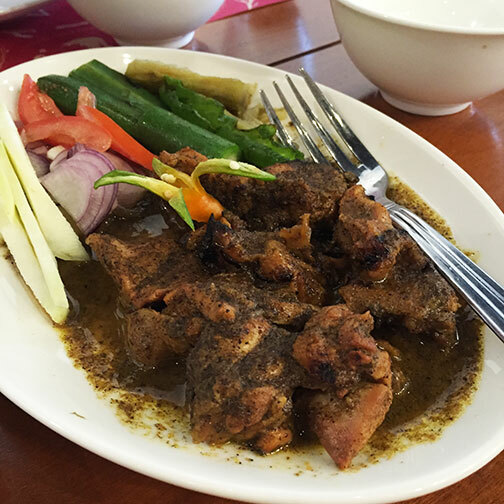 I also liked the pianggang; a Tausug specialty of chicken cooked in coconut milk and a purée of aromatics and spices. From what I can infer, this preparation employs charring grated coconut meat with live coals before pressing the milk out. Along with the spices makes for a very smoky, Moorish flavoured dish. Quite complex and I loved how they paired this with steamed vegetables on the side. 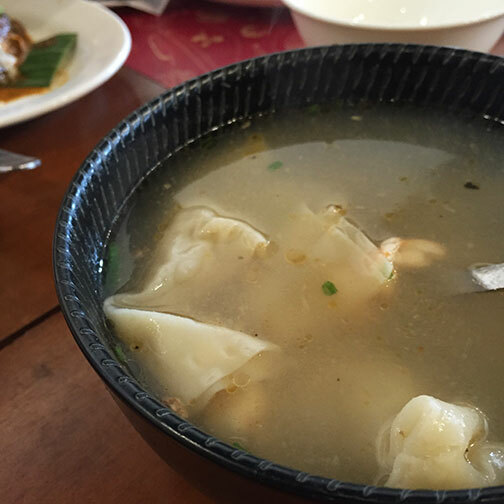 We had a seemingly plain molo soup to start that had this really flavourful broth. And an okoy that tasted more like kaki age; but nevertheless prepared well. 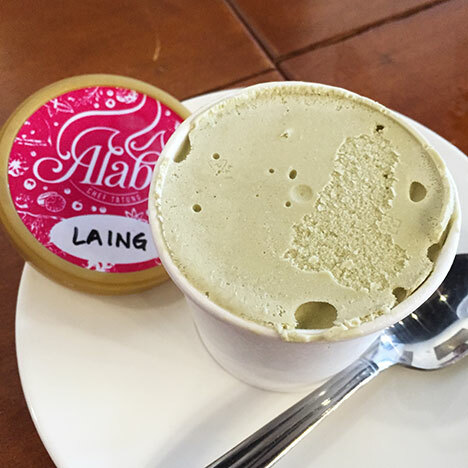 I’m not too big on desserts but they had this laing flavoured ice cream that was quite difficult to resist trying. The server had tried to sway us into to just ordering the quezo de bola flavor, probably thinking we’d blame her if we didn’t like the laing one. But it wasn’t bad. Quite vegetal in flavor, obviously. But it was more akin to a basil ice cream more than anything. It had that warm note from the ginger and a very round sweet/savory profile. Weirdly addictive. 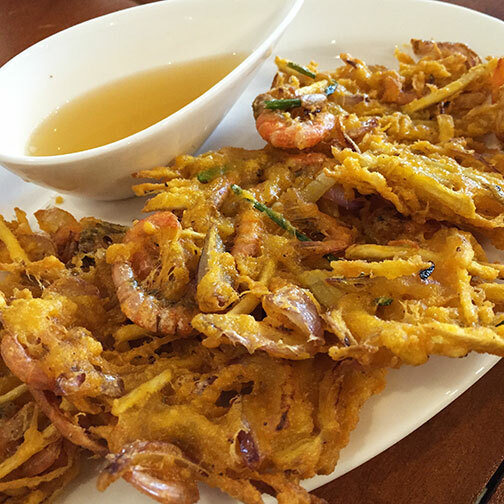 Alab serves more familiar items as kare-kare, his honey lechon and crispy pata, with the Tatung twists, but quite happy that he goes the unfamiliar route with Filipino food and reintroduces them to us hungry diners. It’s not what you would call hip food but it pays homage to roots; through low and slow cooking. Which has always been Chef Myke’s signature.